Some user reported bugs were intentional in 1.12 WoW. 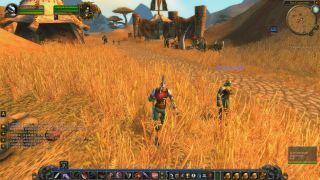 Blizzard has revealed what progress its made since World of Warcraft: Classic's demo and fed back on issues reported by those who played it. In an update on the official forums, community manager "Kaivax" said the team had been "following the discussions" about World of Warcraft: Classic—a recreation of the 2004 MMO and slated to release later this year—courtesy of "fantastic" fan feedback about the demo. "Thank you to everyone who gave us so much feedback to work with, especially the community members who compiled lists of issues that people found with the demo," Kaivax said. "We’ve looked at everything that was reported, and want to share a few anecdotes with you so you can see how we’re tackling these issues." Kaivax went on to detail that while the team had thought it'd fixed an issue with incorrect health regeneration and the spell critical hit multiplier, there was a "discrepancy" with how Classic was configured at the office—which was accurate—and the environment serving the demo to players, which was not-so-accurate. From there, the developer was able to resolve the issue. Other 'bugs', however, turned out to be intentional. "Another issue players reported was that Warlock demon summoning was broken – lots of players said that you shouldn’t lose your current demon until the new one appears," Kaivax added. "We double-checked and in the original 1.12 WoW, and there, as soon as you started summoning a new demon, your existing demon disappeared. So the demo actually matched how the game played originally. There were a few other reports – such as "rare mobs do way less damage" and "Kobolds at Jangolode Mine run faster than walking speed when running away" – where we were able to confirm that the gameplay was the same in the demo as in the original 1.12 WoW." That said, while there are other bugs to tackle before Classic releases, there are some issues that the team "don't intend to address"—such as how the mail works—but the developer has "fixed some fairly high-priority issues", including Critical Strike rating (each item now improves your chance to get a critical strike by X%), Rogue Energy (it was both benefiting from melee haste and re-calculating more often than it was supposed to), Slow Fall no longer applies to your jumps, you will again get pushback when hit by ranged attacks and wands, and Dodge, Parry, and Miss were all not happening often enough. "That’s not all we’ve done, of course, but we want to give you an idea of what we’re prioritizing: core game systems, combat, and content," Kaiax concluded. "We’ve spent time on other things such as user interface and making sure graphics 'feel' like they used to, but our primary focus is on gameplay. "Again, we’re following all of your discussions and loving your enthusiasm – and we’re going to get more information for you posted here soon (not soon™)." In other World of Warcraft news, Zandalari and Kul Tiran allied races are coming soon. Both groups have been at the centre of Battle for Azeroth, but only as NPCs so far. You'll be able to make your own characters on March 12, 2019.